Dr. K has a ton of advice on how to become a veterinarian. She wanted to use her DVM degree in a creative and useful way and is doing just that. From her blog post on Studying Anatomy Like a Surgeon to her podcasts, she is filled with a wealth of information that you do not want to miss out on. Whether you are just starting out and wondering how to become a veterinarian or you have already applied to VMCAS a few times, she touches on subjects that will be helpful for everyone! This interview just touches on the impressive wealth of information that Dr. K has to share. Please go to her website (link at the end of the interview), and learn from her. If anyone is even *thinking* about vet school they should start with her 2 books in the On Being A Veterinarian Series. What to Expect, How to Prepare and Getting the Most out of Vet School. 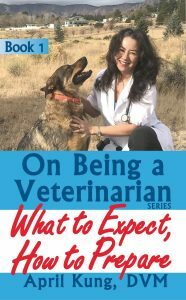 Through her books, podcasts, and blog posts you will find out how to become a veterinarian, how to prepare, what its like to be a vet, and how to navigate vet school. If you need more advice on how to become a veterinarian Check out this book: Veterinary Medical School Admission Requirements (VMSAR) to help you navigate all of the requirements for each college. I attended the Virginia-Maryland Regional College of Veterinary Medicine (VMRCVM) starting in 2007, graduating in 2011. I have 3 dogs: Baron, Leonard, and Agnes. They are naughty, but they are nice too. Since moving to Flagstaff, AZ for my husband’s job, I haven’t worked as a vet. When we first moved here, our dogs got out through a broken door we didn’t know about. The resulting legal proceedings delayed my state veterinary medical license for over a year. After getting my AZ state license, once I started looking around, I realized the veterinary medicine landscape in Flagstaff is totally different from what I was used to as a small animal veterinarian working in the suburbs outside Chicago. Flagstaff is semi-rural and a lot of the practices here are mixed animal. Also, there are no veterinary specialists in Flagstaff. After the horrible experience I had from my second job out of school (which I talk about later), I’ve been concerned about being able to find a practice here where I could be happy. I don’t want to go through that misery again. So I’ve been considering looking into picking up ER shifts in Phoenix but that’s a 3-hour drive from here! Right now I’m waiting to hear about a potential non-clinical job that I’m pretty excited about, but I don’t know if that’s going to come through or not. So I decided to start my own business and have been writing books and blogs and recording podcasts aimed at helping future vets prepare for a career in small animal veterinary medicine, as well as advice on how to become a veterinarian. Personally, I’m really excited about being an entrepreneur and using my creativity to forge a completely unique path for myself while trying to help others at the same time. Sometimes I think part of the psychological malaise so many people feel in modern society comes from not being able to use their innate creativity and not feeling in control of their own destinies. Unless you work for a really exceptional employer, like I did before moving here, it’s harder to express your creativity and feel in control of your own destiny working for someone else. Virginia Commonwealth University (VCU). I was a biology major. Did you attend grad school before becoming a veterinarian? When you made your decision to become a veterinarian, did you apply to vet school after, or during your Bachelor’s education? VMCAS allowed 4 applications at no extra cost so I applied to 4: Tufts, Western, Wisconsin-Madison, and VMRCVM. I only applied to vet schools where I knew I wouldn’t be required to do terminal surgeries. I was listed as first on the waitlist at Wisconsin-Madison. Wisconsin-Madison held no interviews. I don’t know if they do now or not. When you made your decision to become a veterinarian, what were some reasons in your choice of school? I really wanted to go to Tufts because it’s a prestigious school and has an affiliated human medical school. I figured there might be some good cross-talk between the veterinary and human medical school, and I’m fascinated by the similarities and differences between veterinary and human medicine. Tufts also had an international veterinary medicine program that I was interested in because I’d previously lived overseas for several years and liked the idea of being exposed to an expansive worldview of veterinary medicine. But in the end, I couldn’t justify the higher student loan debt I would have had to take on. If I’d been younger, had more working years ahead of me and didn’t have aging parents that I knew I would soon have to care for, I might have chosen Tufts. I still wonder if that had been the scenario and I’d gone to Tufts how I would have ended up feeling about having more student loan debt. I was also very excited about Western because of their humane philosophy but when I went there for my interview I decided not to attend Western. The interviews were fine and everyone was very nice but while I was there I participated in a mock Problem Based Learning (PBL) session. I and a bunch of other applicants were given a medical case and then asked what pieces of information we needed to solve the case and where we should look for that information. I was clueless! I didn’t know enough about medicine to even know where to begin. I think PBL theoretically is a great learning model, but for me, I needed more hand-holding in the early years of my medical education before PBL could have been anything other than frustrating for me. Western also did not have a teaching hospital which meant that I would potentially have to move around a lot as a fourth-year student. I had 4 dogs and 2 cats at the time! I just knew there was no way I would be able to handle the logistics of moving multiple times with my animals as a fourth-year vet student. Western, like Tufts, is also a private school so costs were higher and the living expenses in the area were high as well. I ended up choosing VMRCVM because it was in-state for me and tuition would be lower. Living expenses in the area were also lower. All the doctors who interviewed me were really wonderful and the area and the campus were beautiful. I ended up finding a cute little house to rent that belonged to a rental company called Rocky Acres. They rented this house to me even though I had 6 pets! I’ll be forever grateful for that. The house even had a fenced yard. I put in a dog door and that made my life as a busy vet student a lot easier. I loved my time at VMRCVM. I really felt a part of a big family there. Both the administrators and the professors there, at least when I attended, really went out of their way to take extra special care of first-year students. We really needed that too, because vet school is incredibly intense. As a first-year student, that special care and attention was a huge help psychologically. Because of my past professional experience in advertising and corporate communications, I was good at preparing for interviews, and I prepared for my vet school interviews as if I were going to be interviewed by the CIA! I knew there was nothing they could ask me that could catch me off guard. Verbal 640. Quantitative 640. Analytical Writing 5.5. A lot of advice on how to become a veterinarian says to have a lot of varied animal experiences. Did you have exotic, large and small animal experience prior to applying to veterinary School? I only worked at small animal hospitals as a veterinary assistant before applying. I think I had barely more than the minimum number of animal-related experience when I applied. Because I was 37 when I applied, I had a lot of previous work experience. I worked in Hong Kong, Sydney and Beijing as an advertising executive for Ogilvy & Mather, I worked as a communications contractor for Capital One in Richmond, VA, I worked as a contractor on promotional projects for McDonald’s in Chicago. I’d started my own pet-sitting business. I’d waited tables, taught aerobics and even sold vacuum cleaners! Big Brothers, Big Sisters, various animal shelters. 2: A friend who was a vet and the dean of the local dental school who was a friend of a friend. I decided to become a veterinarian after reading a book called Cosmos by Carl Sagan. Before that, I avoided science because I thought it was too hard and not interesting. Cosmos made me realize how interesting science actually is. After that, I took 1 biology class at VCU just to see if I could get a good grade and how hard it would be. At that time, I didn’t even know whether I was smart enough to be a vet. When you began to research how to become a veterinarian, did you interview any vets before starting the application process? No. I had casual conversations with various vets I’d worked with but never really interviewed them. I was president of SETA at VCU. SAVMA, VBMA. I wasn’t really active in these clubs and I don’t remember if I felt they were helpful. I had worked so darn hard to make myself a strong candidate for vet school that I didn’t feel like being active in a lot of extra-curricular activities once I got into vet school. It was hard enough just trying to keep my head above water in my vet school classes. Two veterinarians, the head of the VCU science department (I’d worked with him to develop a non-dissection option for VCU biology students), a genetics professor, and a humanities professor for whom I’d coordinated various on-campus events. The only stressful part for me was getting all the necessary pieces together and making sure I was filling out the applications correctly. I really hate filling out forms! But it was really just logistics. I wasn’t stressed about whether I would get interviewed or accepted – I figured – I had done my best and what would be, would be. I just tried to take it one step at a time. Are you happy that you chose this career? What makes you most happy about this career choice? Are there any things you’re unhappy about? I’m happy to be a DVM. I’m happy that I know what I know. I’m happy that I understand medicine because medicine is amazing and endlessly fascinating. I’m happy that I can help animals by performing surgery or prescribing medical treatments. I also feel so incredibly lucky to be a veterinarian because veterinarians are, for the most part, really interesting and kind people. I love the vet med community. That being said, there are things I’m not happy about. The obvious issue being the amount of student loan debt. Even as an in-state student, I graduated with 220K in student loan debt. I think most financial experts advise a debt to income ratio of 1.4 or less – meaning your total student loan debt is no more than 1.4 times your annual salary. Some experts say the ratio should be 1:1 – meaning your annual salary should be equal to or more than your total student loan debt. My first salary out of school – which was higher than the average starting salary for veterinarians – was 85K. That made my debt to income ratio 2.6:1. Some vets are really great with money and good at being frugal and are able to pay everything off in ten years or less. I’ve interviewed a couple on my podcast. But after I graduated, I felt that I’d worked so hard for the last 8 years – really the totality of my life for the past 8 years had been about studying – so when I finally graduated and started working, I needed to enjoy life a little. Also, being a vet was nothing like any of the jobs I’d had before. It was harder and more stressful than anything I’d ever experienced. I needed to be able to go out for a nice dinner or a show or to go somewhere for a break every now and then just to balance out that stress. I’m also really concerned about the high rates of depression and burnout in this field. I suffered from both, and attribute it to unrealistic expectations and just feeling really alone when I started. I felt like I must be the only new vet struggling the way I was. I think it was also not knowing what to look for in an employer – that’s what got me into trouble at my second job. Even though I had all this other professional experience, it didn’t help me from ending up in a terrible place. Vetmed is its own unique universe. It’s almost impossible to know what to watch out for when you’re just starting out. That’s why I decided I was going to strike out on my own to help future doctors avoid the mistakes I made. I want to see the field of vetmed brimming over with happy, empowered veterinarians who are in full control of their own lives and careers. Throw a big party and invite your family and all your friends. You’ll deserve the celebration, and after vet school starts, you’ll have few opportunities to spend quality time with your favorite people. After you graduate, throw another big party! In addition to solo study, form a study group with some classmates and meet on a weekly basis. You’ll all understand things differently and discussion will enhance everyone’s understanding of the material. Additionally, your study group is going to provide the essential (and possibly only) social support you’ll have while you’re in vet school. Clinical pathology – that’s the class where I first started thinking like a doctor. My favorite cases have always been C-sections. One of the best feelings in the world is looking at your post-op C-section patient as she rests comfortably and nurses her babies. There have been countless challenging cases throughout my career so far, but I’ll just mention one here. A dog presented to the ER for hemoabdomen (blood in the abdomen). There was no history of exposure to rat poison and clotting times were normal. Our ultrasound machine was broken at the time so I couldn’t use it to look for a mass on the spleen, and abdominal radiographs weren’t helpful because when there’s fluid in the abdomen it can be difficult to make out what’s going on in there. We stabilized him and then took him to surgery expecting to find a bleeding splenic mass. When I got in there – there was no spleen! This just goes to show how unpredictable medicine and surgery, especially surgery, can be! I had 3 regular jobs – 1 as an ER vet and 2 as a GP vet. Plus I did a bunch of relief work at many different hospitals. The ER hospital where I started my career was great. I don’t think I appreciated just how good I had it there until after I left. The second place I worked – a general practice – was a nightmare. I almost completely lost my physical and mental health because of the stress of working there. I only stayed 6 months at that place. The third place I worked was the best, and I would still be working there if we hadn’t moved to Flagstaff. For the first 3 years after graduating I probably spent 10-15 hours every week researching cases I’d seen. This is par for the course for new grads. There’s still so much you don’t know when you graduate from vet school. As one of the doctors I interviewed for my podcast so cleverly put it, vet school gives you the blueprints for being a vet – it’s up to you to build the house. After I became more experienced, I was able to look up what I needed during working hours as I worked through my cases. But this is something future veterinarians should keep in mind – even experienced vets need to look stuff up all the time. You can’t keep every piece of medical knowledge in your head at all times. That’s why we have to do continuing education every year. Also, I still read medical journal articles every week. You’re just never done learning as a doctor, whether you’re a veterinary doctor or a human medical doctor. Have you read or listened to anything worth sharing, or anything on how to become a veterinarian? I recently came across a podcast called Vet School Unleashed; Dissecting the DVM. It’s hosted by a vet student at the University of Missouri by the name of Seth Williams, and he focuses on life in vet school. Do you have any last words of wisdom or advice on how to become a veterinarian and navigate life after vet school? I would recommend that anyone thinking of becoming a veterinarian thoroughly research the realities of this career before entering vet school. (Once you start vet school you’ll be too busy!) More resources are available now than were available when I was looking into this career. I ended up entering the field being quite unaware of the challenges I would face. I really wasn’t prepared for the reality of being a small animal veterinarian at all. Actually, none of the vets I know felt prepared when they started out. And if you’re not prepared, you end up feeling like you’ve been hit by a freight train. There are so many great possibilities that being a veterinary doctor affords you. The DVM degree has the potential to empower you to do so many amazing things and to have such an amazing life. However, if you don’t prepare for the challenges you’re going to face along the way, instead of being able to proactively steer your career, you’re going to be at a disadvantage. It’s much more difficult to mold this career into exactly what you want it to be if you end up reacting to the challenges instead of anticipating and preparing in advance for them. Dr. K has a wealth of information on how to become a veterinarian, as well as navigating life after vet school. Take a look at her website and learn from her! Dr. Eller is working on her PhD way after graduating vet school. She works in the field of veterinary forensics. Dr. Buisson realized that private practice didn’t agree with her and she found her own unique career path. Dr. Gardner started Lap of Love, which is now a nationwide practice dedicated to end of life care for pets.